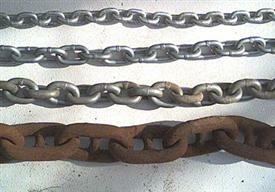 A heavy bottom chain will add strength to your mooring and reduce strain on the anchor itself. The weight of this chain will help to absorb the shock by lifting slightly when the boat pulls back. . The smaller top chain will go from the bottom chain to the mooring ball and will create an arc when the boat pulls on it reducing the load. US mooring chain is Gr 43 long link.